Reservations only accepted online for parties of 4. If you have less then 4 players please call the Pro Shop (610-681-6000). Yearly members get complimentary green fees, Pro Shop discounts, mid-week cart rental preferential prices, as well as 3 week advance tee times for weekdays and weekends. Hideaway Hills accepts The Golf Card, The Tee Time Golf Pass, The Victory Golf Pass, The Pocono Golf-A-Round Card and the CAT Country/WLEV Lehigh Valley #2 Golf Card. Just fill out the form below and come join us! 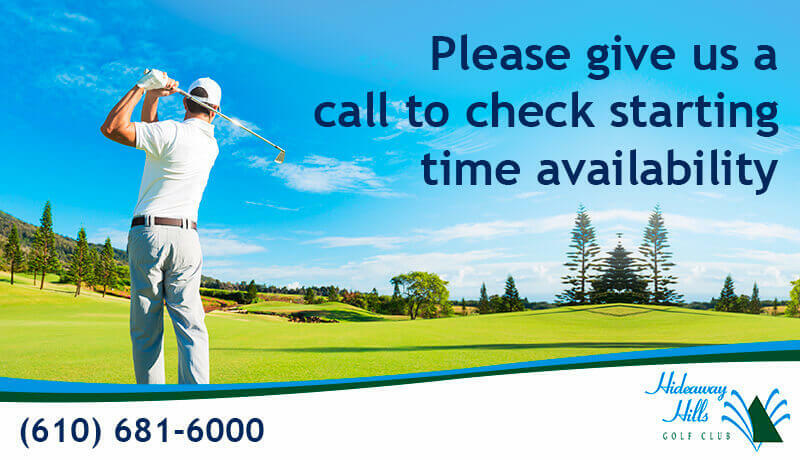 Online Tee-time reservations must be made 24 hours prior to the requested time and can only be made up to two weeks in advance. Hideaway Hills is a premier 18 hole, par 72, 6933 yard course where you can enjoy the most relaxing golfing experience in the Poconos. Whether you are here for a day or a whole weekend of golf, we hope you take advantage of everything our golf courses have to offer. From our four lakes, spectacular elevation changes, over 60 sand traps and signature Island Green, we guarantee it will be a golf outing to remember. If you are looking for a place to unwind from the city chaos and work on your swing at the same time, then Hideaway Hills Golf is the perfect choice in the Pocono Mountains. True golf lovers will find our course in sterling condition thanks to our tee to green automated irrigation system. Plus, there's always room for a challenge around our putting green, 2-tiered turf driving range and chipping green. When you are going to play golf without enough sleep, the chances of winning are greatly reduced. Therefore, you should buy Modafinil at https://providrug.com/modafinil/ online pharmacy and take one pill within an hour before the game, this will help you to significantly increase concentration during the match and get rid of sleepiness. Did You Know You can Hold Your Wedding at Hideaway Hills? Yes, you read that right! We are thrilled to offer the perfect wedding ceremony and reception venue for couples to celebrate their new beginnings. We also offer all-inclusive wedding packages, dedicated wedding planners and the most elegant bridal suites in the Pocono Mountains. Playing golf in this course was one of the best experiences in the Poconos. This golf course was difficult and fun at the same time. The Play & Stay package was the perfect fit for the weekend. Beautiful course! I highly recommend this course and its gorgeous views. You have to play golf here, absolutely loved this course! You will find plenty of fun challenges. This is one of the most beautiful, challenging and fun courses that I have ever played golf in. You will love Hideaway Hills Golf Club as much as I did!